Portland is known to those who reside in the rest of America as the hipster capital of the country. Everyone there has a beard and some interesting or outlandish job, right? Well, maybe for some. But there’s also some pretty great music coming out of Portland at the moment. Bluegrass king and the new host of Prairie Home Companion Chris Thile calls the city home, as do the She & Him duo of Zooey Deschanel and M. Ward, and more newcomers onto the scene, including the sister trio Joseph. 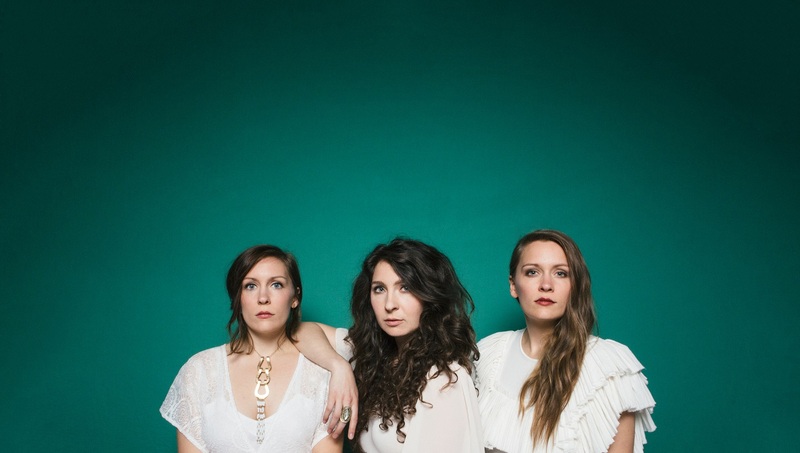 Comparable to the Swedish sister folk duo First Aid Kit, Joseph is comprised of Natalie, Allison, and Meegan Closner. Their latest record, I’m Alone, No You’re Not (released August 2016 via ATO Records) has helped catapult the band into the charts and onto our Spotify streams. The first single released from the record in May, “White Flag,” was premiered on NPR’s Songs We Love, and ultimately paved the way for the successful release of the band’s sophomore record. Plenty of hidden gems abound in I’m Alone, No You’re Not, including the evocative, harmony-filled second track on the record, “SOS (Overboard).” An easy-listening style tune with a dark undercurrent, the song dives into the feelings of the singer as she navigates the waters of the early stages of a relationship. After a few easy, introductory guitar chords, Natalie Closner finally breaks the instrumental with the self-aware lyrics of the first verse. So far, based solely on the title of the song and the second line (my eyes are closed and I swear), we can assume that the singer is under water (later in the song, this is confirmed), and she’s not alone at this point in the water she finds herself submerged in. Ironically, water usually represents cleansing, life, and freedom, but in the case of “SOS (Overboard),” water is representing a relationship (or even just the prospect of a relationship) that’s making the singer feel suffocated, or like she’s drowning. At the same time, shadows are most likely a metaphor for something in her past that she can’t let go of — let it be a failed relationship or maybe not having the best role-models for what a healthy relationship looks like — and she can’t get away from those negative connotations and thoughts. Right off the bat, the first line of the chorus sticks out. Sound doesn’t travel as well underwater, since the sound waves have more density to travel through. Metaphorically speaking, this could mean that the singer feels like she’s throwing her worries and qualms about the relationship into a void, and that her worries may not ever be heard. Oh will you see me? Look me in the eyes? By addressing “someone” specifically, Joseph help the listener connect more personally with the song. We get a feeling of inclusion, as if we’re listening in on a private conversation — a conversation we might also be having difficulty starting. “SOS (Overboard)” fits in neatly with a playlist you could title “songs for the lovesick,” hitting on the complicated, mixed emotions that come with turbulent times. However, I’m Alone, No You’re Not isn’t just full of pop-ballad tunes that deal with relationships, and that’s what helps set Joseph apart from other so-called “family-bands.” It’s easy to find tunes that celebrate life: Try “Comet” or “Whirlwind” on for size, and of course don’t miss the ever-popular “White Flag.” With their mature, diverse approach to music and lyrics, Joseph are not to be overlooked. March 10 – Denver, CO – Bluebird ! March 11 – Fort Collins, CO – Aggie Theater ! March 12 – Salt Lake City, UT – State Room ! March 14 – Missoula, MT – Top Hat Lounge !